Under the Jawaharlal Nehru National Solar Mission (JNNSM), the total aggregated capacity of grid connected Solar Projects in Phase-1 shall be 1000 MW. The deployment of Solar PV and Solar Thermal projects shall be in the ratio of 50:50. The allocation of capacities in Phase-1 is done in two batches and over two financial years i.e., 2010-2011 and 2011-2012. The total capacity of Solar PV projects to be selected in First Batch i.e., in FY 2010-11 was limited to 150 MW. The Projects for remaining capacity of 350 MW for Solar PV Projects will be selected in current Second Batch i.e., in FY 2011-12 (See detailed guidelines from earlier post 'Solar JNNSM Batch-2 pickup - RfS deadline 23 Sep'). Grid connected Solar Thermal power projects of an aggregate capacity of 500 MW have already been selected in FY 2010-11. The mission has designated NTPC’s Vidyut Vyapar Nigam Limited (NVVN) as the nodal agency for procurement of solar power. On 18th August 2010, NVVN invited Request for Selection (RfS) from interested developers to develop 150 MW solar PV projects with a capacity of 5 MW each, and 500 MW solar thermal projects with a minimum capacity of 5 MW and maximum of 100 MW each. The last date for receiving the RFS was September 24, 2010. NVVN received 418 RfS from both PV and Solar Thermal project developers. Out of the total of 418 requests, 343 were applications for solar PV and 55 for Solar Thermal. The interest in investor community was high with Solar PV receiving 343 applications (x 5MW = Total 1715 MW) against requirements for 30 projects (total 150 MW) i.e. 11.43 times higher application. The process then went into 'reverse bidding' to select only 30 bidders, with winner being the company that can offer highest discount to base set tariff rate of Rs. 17.91 per kWh. 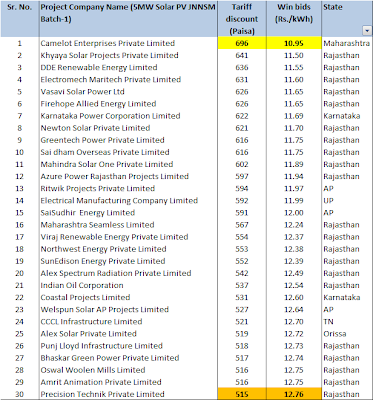 The 'winner' 30 bids for solar PV under Batch-1 varied from Rs. 10.95/kWh to Rs. 12.76/kWh, at an average bid price of Rs. 12.15/kWh. 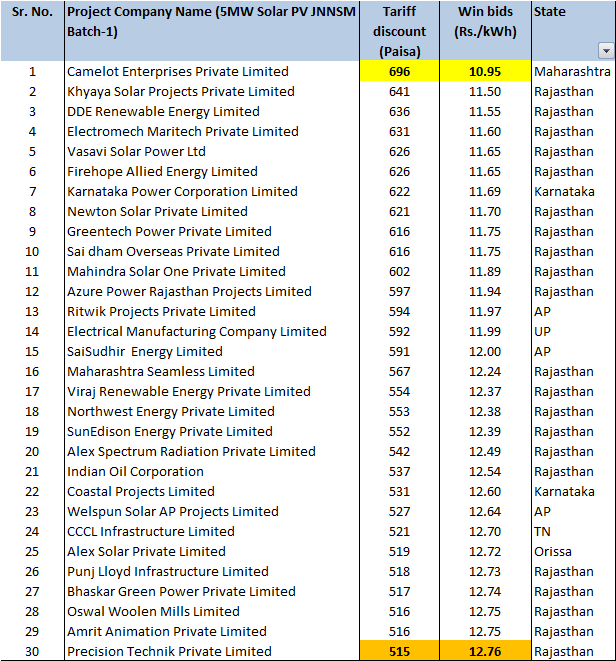 Major institutional players like Moser Baer, Solar Semiconductor, Titan, Lanco, AstonField Solar, SunBorne, IL&FS and others couldn't win any direct project through bidding. With more experience and supporting ecosystem now, has project cost gone below than Rs. 12.5 cr/MW? With 11 times over subscription last time, would Batch-2 see similar and higher interest in the investors? Would tariff bid rate band go further below than Rs. 10.95 to 12.76 per kWh? Are there better financial linkages with more favorable financing terms now available to increase investor's confidence to participate in Batch-2? 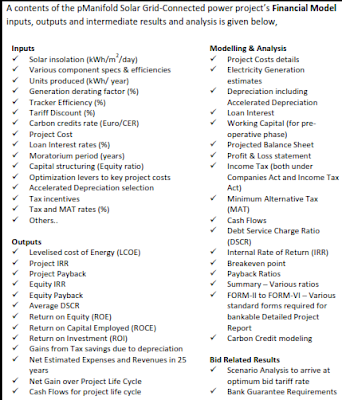 pManifold has evolved a very detailed Excel model for Solar investment analysis, specially for grid connected plants. The Excel model is available for purchase. A brief glimpse into our Solar Investment model parameterization is shown. As part of the Solar Practice, pManifold focuses on helping clients keep pace with the fast evolving industry and the opportunities there in through services for - Bid Advisory, Strategic Consulting and Investor Education.